When we first developed the Heroines of History series, our goal showcase the lives of faithful women, that together we may be inspired and encouraged to live a life closer to Christ. Yet, do you ever look at these stories as a check list, and think that what makes these women remarkable is their actions? She started an orphanage. She rescued kids from slavery. She moved to dangerous places as a missionary. I've made that mistake, too. But my sweet sisters, today I simply want to remind you that their lives, and our lives, matter not because of what we do but who we are and the faith we have. What matters is not how public our lives are, whether anyone ever oohs and aahs over something that we accomplish. Yet I know how much of a struggle it can be to believe that, especially in a world that is so performance-based, and especially if you battle perfectionism as I do. This past spring, both Joanna and I were super sick - continents apart! Thankfully, many of her ailments seem to have been simply temporary and awful. While I am still recovering, I am hoping this is something that also doesn't last but is simply a case of building my body back up. That said, there were many moments where I felt simply defeated. It was hard to work, I felt frustrated that I couldn't make a contribution to my family and required care instead, and I felt completely useless. The pain was a sideshow to the battle in my heart. It's still a battle, to be honest. But I want to learn from the spring, and respond with faith throughout various health problems. 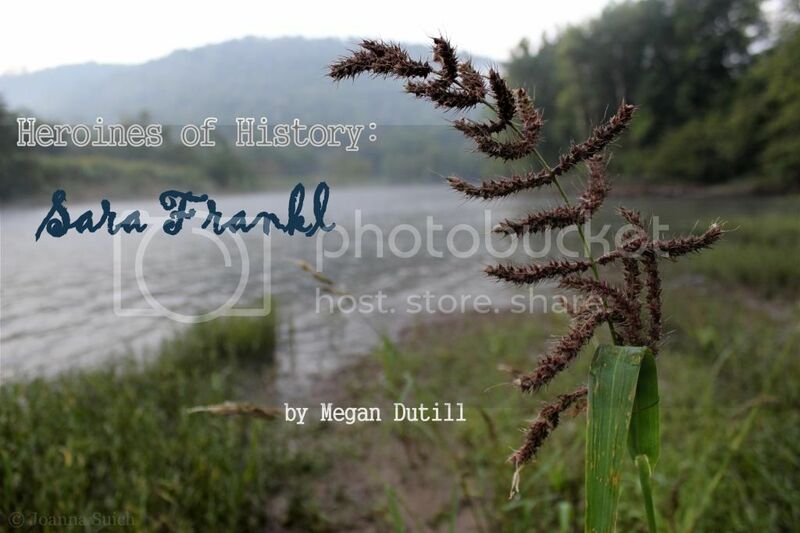 That's why today I want to share a little bit about Sara Frankl (link is to her personal blog). She perhaps never did anything you would think remarkable. She didn't move to a foreign country or start a nationally-recognized ministry. In fact, for many years near the end she was bedridden and would need to conserve her energy for several days to be up for a short visit with a loved one. And yet: Her faith was larger than life. Despite her inability to ever go outside due to reactions, her bed-ridden state, the fact that she had to give up her singing, her career, and her dreams of a family of her own - those who knew her described her as the most joyful person they knew. She chose joy, she chose praise, and she chose faith. In the midst of debilitating physical sickness and life circumstances she would never chose. And she made a difference in this world, just because she was faithful and chose to praise in the midst of deep pain. We will all have painful trials, both because that is how God refines us and grows our faith and because the world is sinful and broken. So if you need encouragement right now, please turn to her writings (link is to the (in)courage articles) and delight in her story. She brought praise and honor wherever she went, and that is a goal we can attain in any circumstance. We're learning right along with you, lovelies. "I choose the joy. When something is going badly and I’m dwelling on it, I think instead of something for which I am grateful. I swear to you, it’s as simple as that. You just have to decide today, and again tomorrow. And before you know it, you’ll have an attitude of joy more than any other attitude you have at your disposal."